Covered with dense forest and protected by swamp to the west and tortuous hills to the north, South Gippsland was one of the last regions of Victoria to be settled. This section mentions some of the difficulties and looks at some of the drivers to development, as well as the man who gave South Gippsland its shape. 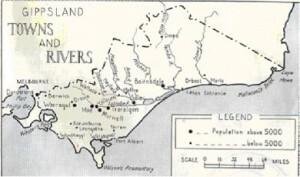 Long after the western and central areas of Victoria were settled much of Gippsland remained unknown. The Strzelecki party had travelled through the area in 1840 and finished up at Western Port barely alive. The mountains of South Gippsland were covered with dense forest and the coast lined with mangrove and ti- tree. Entering the area was thus very hard. The drier eastern areas had been settled by graziers who followed the route found by Angus McMillan. They came from NSW to Omeo and on to Port Albert. Port Albert had been established in 1841 for the exporting of cattle to Tasmania and settlers came into the region via this entry point as well. The discovery of gold at Walhalla in 1863 had opened up a coach route from Dandenong and settlers had moved into the hilly country east of Dandenong as far as Drouin. The Gold Rush had brought a great number of settlers to Victoria and by the late 1860’s people wanted land to be opened up for sale. A Land Act was passed by the Government in 1869 and this allowed a “selector” the right to take up 320 acres of land (half a square mile) for the yearly rent of 1/- per acre. In the measurements and money of today this was an area of 90 hectares for a rent of 25 cents per hectare per year. This sounds cheap but remember that the income for an adult male was around $2 a week. After 20 years of payment and by meeting the conditions set down by the government the selector would own the land. Settlement into South Gippsland went on for nearly thirty years following the Land Acts. The pioneers were generally not well off and had little farming experience. They knew very little about the country they came to and believed that obtaining land would be the best thing for their future. “The general idea I got was that Gippsland was a flat country covered with a dense scrub something like tea-tree. I could not imagine at that time that mud and hills could exist together”. 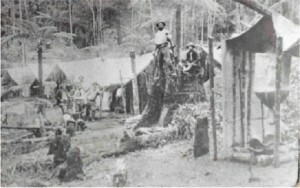 Once the land was selected, the pioneer went to Melbourne to lodge his application with the Lands Department. All this might take as long as a year. After paying the lease costs, clearing the minimum area of land required each year and living on the land for three years, they were entitled to a proper lease. The settler then had to pay the balance of the money due to the government 14/- (14 cents) per acre. This was to be paid in 14 half yearly instalments. After this was done a freehold title would be granted to the pioneer. They owned the land outright and could sell it if they liked. South Gippsland has its shape due to the work of surveyor Lardner, who is buried in the cemetery at Leongatha. Many places in Gippsland carry the name of the great surveyor, who was active in the region between 1873-1890. The government made the selection process more structured by having the land surveyed into farms and townships and then selling the allotments by number. This was very important in South Gippsland as much of the land was purchased after surveying. If you live on a farm it will be part of one or more crown allotments and the number of this may appears on your rates. You can trace the history of your farm by researching the file of the crown allotments at the public records office. Surveyor Lardner came to the Moe area in 1873 and divided up 10,000 acres for selection. In the following years he surveyed 11,000 acres in the Koo-wee-rup Swamp. In 1877 he was again in Gippsland to survey towns along the new Gippsland rail route. He laid out every town from Pakenham to Morwell and continued work until 1890, surveying roads to connect the railway and the new settlements to the south as far as the coast. This included the Coast Road from Morwell to Inverloch. He divided much of South Gippsland into farms and settlements and laid out all the townships along the Great Southern Railway line, including Korumburra and Leongatha.